Nerva is flat and minimal portfolio WordPress theme suitable for portfolio sites, creative agencies and pro bloggers. Nerva is 100% responsive layout available in 2 colour schemes and built with powerful admin panel helps you to customize your site look and feel with ease. It has Boxed and full width layout options with 2 beautiful footer / header styles and loaded with 6 unique home page layouts. Nerva is SEO friendly WordPress theme supports multilevel drop down navigation and theme tested with most modern browsers. 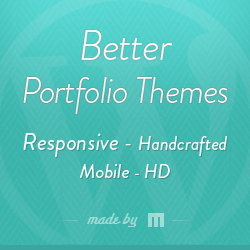 Its periodically updated WordPress theme compatible with WordPress 4.4+ versions. Comes with blog section, included with various post templates, custom widgets and integrated with BxSlider responsive content slider to handle header slider enabled to support advanced touch / swipe support. Nerva portfolio WordPress theme designed from scratch to be fully compatible with Bootstrap 3 frontend framework, supports font awesome icons and looks perfect on retina displays. Integrated with ajaxified contact form and 5 custom widgets to add some futuristic changes in your website.